The claim sounded believable only because Gambino’s retirement would hardly put a dent in the career of his creator, Donald Glover. Aside from singing and rapping as the Grammy-nominated Childish Gambino, Glover is also a popular Hollywood actor (“Spider-Man,” “Solo: A Star Wars Story”), a lauded TV show creator and writer (“Atlanta,” “Community, “30 Rock”), and a beloved stand-up comedian. Glover’s broad base has allowed him to release more idiosyncratic music than most Garden-packing performers could dare. Onstage, he pushed the envelope from the start, opening with a long, unreleased new song, “Algorythm.” Standing motionless at the end of a runway by a single vertical laser beam, the bare-chested singer let a recording of his voice deliver a slow, gospel-y melody for well over two minutes before he finally jerked to life with a fast-paced rap. “This is not a concert; this is a church,” he explained afterward, promising a performance with no simple pleasures. Even so, as with every Glover venture, pleasure was definitely part of the mix. 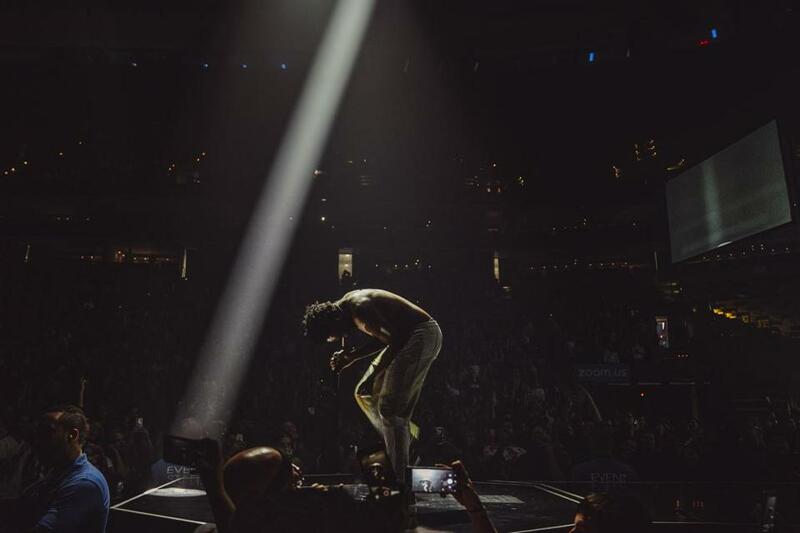 Although the artist’s intricate raps were garbled by the arena’s inevitable echo, his thin high vocals held strong on selections from his 2016 retro-funk album, “‘Awaken My Love.’” And Glover’s dancing, the varied video projections and lighting, and the expert live band hidden deep at stage left helped most numbers hit an endorphin center. But they also gave the show a veneer of multimedia performance art, with disturbing contradictions underlying the infectious grooves and pretty melodies. In a 45-minute opening set, Atlanta-based duo Rae Sremmurd ably and amiably represented the strip-club side of the trap music sound that Glover explores in his “Atlanta” TV series. Franklin Soults can be reached at fsoults@gmail.com. Follow him on Twitter @fsoults.